The research is crystal clear: when combined with a proper diet and fasted exercise routine, FORGE will help you lose fat faster, preserve muscle, and enjoy your workouts. While our choices of ingredients alone set FORGE apart from the rest of the crowd, what really proves its superiority is that each ingredient is included at clinically effective dosages. That means that the dosages of each ingredient in FORGE are based on published scientific research proving their benefits, not the restrictions of razor-thin production budgets or gluttonous profit margins. While everyone claims to have the best fat burners on the market, we believe we can actually back up such a claim with real science and real numbers. If you want to use fasted exercise to lose stubborn fat, and not muscle, faster...without having to sacrifice the quality of your workouts...then you want to try FORGE today. If you’ve ever looked for advice on how to lose fat faster—and especially “stubborn” hip, belly, and thigh fat - you’ve probably read about exercising on an empty stomach. According to many experts, training on an empty stomach is a simple but powerful way to increase the amount of fat your body burns while you work out. There’s truth in this advice but there’s also a problem: it’s not that simple. How empty of a stomach, exactly? What types of exercise work best? Are there any drawbacks? More importantly, however, what does all this have to do with FORGE? To understand how FORGE accomplishes these targets, we need to take a closer look at how training an empty stomach really affects fat loss. The first thing you need to understand is it’s not enough to simply have a stomach that feels “empty.” This guarantees nothing in the way of accelerated fat loss. What can help you lose fat faster, however, is training in a “fasted” state, which has to do with the levels of various hormones that affect fat loss, not how empty or full your stomach is. Eventually your body finishes processing the food and insulin levels drop to a low, stable baseline level, where they remain until you eat food again. This is known as the “postabsorptive” or “fasted” state. Every day your body flips back and forth between these fed and fasted states. Exercise done while your insulin levels are elevated and your body is still processing your last meal is fed training and exercise done when your body has finished digesting food and insulin is low is fasted training. Now, there’s nothing wrong with training in a fed state. Any exercise burns energy, which supports your weight loss efforts. What many people don’t know, however, is that training in a fasted state offers several unique fat loss benefits. What this means is when you exercise with your insulin at a baseline level, your body is able to both mobilize and burn more fat during your workout than when insulin levels are elevated. One of the problems with stubborn fat is the reduced blood flow in the regions and fasted training can help address this. There is a major downside to fasted training, however: it significantly increases muscle breakdown rates. This is undesirable because if you damage and break down too many muscle cells in your workouts, your body won’t be able to keep up with repair and you can lose muscle over time. As you can see, fasted training is a double-edged sword. It’s good for losing fat faster but not so good for maintaining muscle and enjoying your workouts. Now, most people familiar with how fasted training works use branched-chain amino acids (BCAAs) to counteract the muscle loss. Branched-chain amino acids are one of the most popular—and overrated—supplements on the market today. Consumers are often told that BCAAs are as effective as creatine at helping build muscle and strength and as fundamentally useful as whey protein. The marketing works, too—go to just about any gym and you’ll see at least a couple of guys and gals lugging around a jug of neon BCAA-infused water. The reality, however, is that BCAA supplements aren’t nearly as special as they’re made out to be. To understand why, let’s first talk about what these supplements are comprised of. Branched-chain amino acids are three vital amino acids that your body must get from your diet: leucine, isoleucine, and valine. There are large amounts of branched-chain amino acids in high-quality sources of protein like eggs, meat, and dairy. For example, a 6 oz serving of chicken gives you about 6.6 grams of BCAAs. The same amount of beef gives you about 6.2 grams and turkey and various types of fish also provide about 1 gram per ounce. The point is this: eat enough of these foods rich in amino acids and you’ll get all the BCAAs you need. The reason why BCAA supplements are so popular is they’re really easy to sell. If we wanted to jump on the BCAA bandwagon, we could cite a handful of studies that (apparently) demonstrate an impressive array of benefits including more muscle growth, endurance, and recovery. What we wouldn’t tell you, however, is that the studies’ findings just aren’t practical to the average physically active person following a sensible workout routine and high-protein diet. What we also wouldn’t tell you is that you can give your body all the branched-chain amino acids it needs to recover and build muscle through food alone. In fact, there’s research that indicates this is more effective than supplementation. BCAAs do have one legitimate use that we’re interested in, however, and it relates to fasted training. As BCAAs include leucine, and as leucine suppresses muscle breakdown, a BCAA supplement is useful for preserving muscle while training in a fasted state. BCAAs, on the other hand, have a smaller impact on insulin levels than food, which allows you to remain in a fasted state while you train. This is why many people “in the know” supplement with them before fasted exercise. You’re paying for three amino acids but leucine is the only one of the trio that effectively suppresses muscle protein breakdown. You could save money and achieve the same results by buying pure leucine instead (but be warned—leucine tastes really, really bad). Most BCAA supplements are comprised of 2 to 3 parts leucine and 1 part isoleucine and valine, which means you need to take quite a bit (about 10 grams) to get the 3 to 5 grams of leucine required to counteract the muscle loss that results from fasted exercise. This means you burn through bottles fairly quickly if you’re training fasted 5 to 7 days per week. Thus, when we set out to create a fat loss product specifically for fasted training, we chose not to include BCAAs. You just don’t get much “bang for your buck,” so to speak. What we did instead is create a combination of molecules that together amplify the fat loss benefits of fasted training, neutralize the increase in muscle protein degradation, and raise energy levels and sharpen focus. The bottom line is FORGE is better than BCAAs because it helps you lose fat faster, preserve muscle, and have better workouts, whereas BCAAs just help you preserve muscle. Not only that but we created FORGE to work synergistically with our fat burner PHOENIX and pre-workout drink PULSE. In short, we set out to create the ultimate fat loss “stack” that enables you to lose fat as quickly and healthily as possible. Let’s take a look at FORGE’s formulation and see how it works. The physiology is quite complex, but what you need to know is when catecholamines bind to beta receptors, fat cells mobilize for burning. When the chemicals bind to alpha receptors, however, the cells don’t mobilize. Research shows that yohimbine blocks the activity of alpha receptors. This enables your body to reduce fat stores faster, and it’s particularly useful as you get leaner and are battling with stubborn fat holdouts. 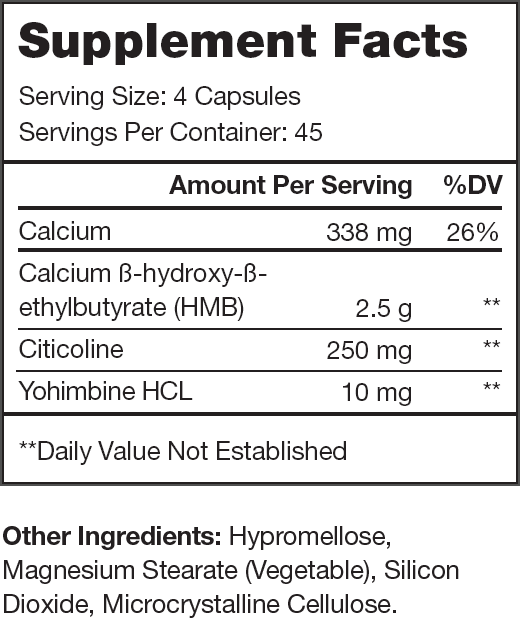 Clinically effective dosages of yohimbine range from 0.1 to 0.2 milligrams per kilogram of body weight. We chose this dosage per serving, and chose to include 2.5 mg of yohimbine per capsule of FORGE, because it allows for flexibility in dosing to meet the needs of various body weights. This dosing also allows for maximal safety. While yohimbine is generally well tolerated in lower doses, overdosing can cause various negative side effects like agitation, anxiety, hypertension, and tachycardia. This is why people with anxiety and panic disorders are not advised to take yohimbine. 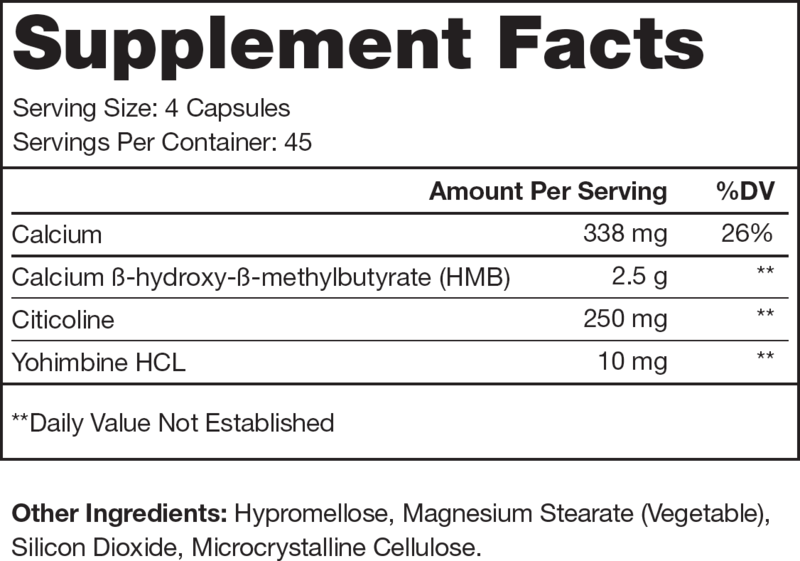 So for example, a clinically effective dosage of yohimbine for a 150-pound woman would be 7 to 13 mg, and 1 serving of FORGE (4 caps) fits nicely in the middle. If it’s well tolerated, she could add 1 additional capsule to her pre-workout dosage and reach the top of the clinically effective range. A clinically effective dosage for a 200-pound man, however, is a bit higher: 9 to 18 mg. In this case, he could start with 1 serving per day to assess tolerance and move up to 6 to 7 capsules before training for the full clinically effective dosage for his body weight. That is, it’s very good at preventing muscle breakdown, which means you will recover faster from your workouts and experience less muscle soreness. This makes HMB perfect for use with fasted training. Its powerful anti-catabolic effects and non-existent insulin effects means you reap all the fat loss benefits of training fasted without any of the problems relating to muscle loss or insulin secretion. Clinically effective dosages of HMB range between 2 and 3 grams. CDP-choline (also known as citicoline) is a chemical that occurs naturally in the brain that increases levels of another chemical called phosphatidylcholine, which is vital for brain function. We chose to include this in FORGE because most people find fasted training more mentally draining than fed training and CDP-choline can help counteract this. For attentional purposes, clinically effective dosages of CDP-choline range from 250 to 500 milligrams. 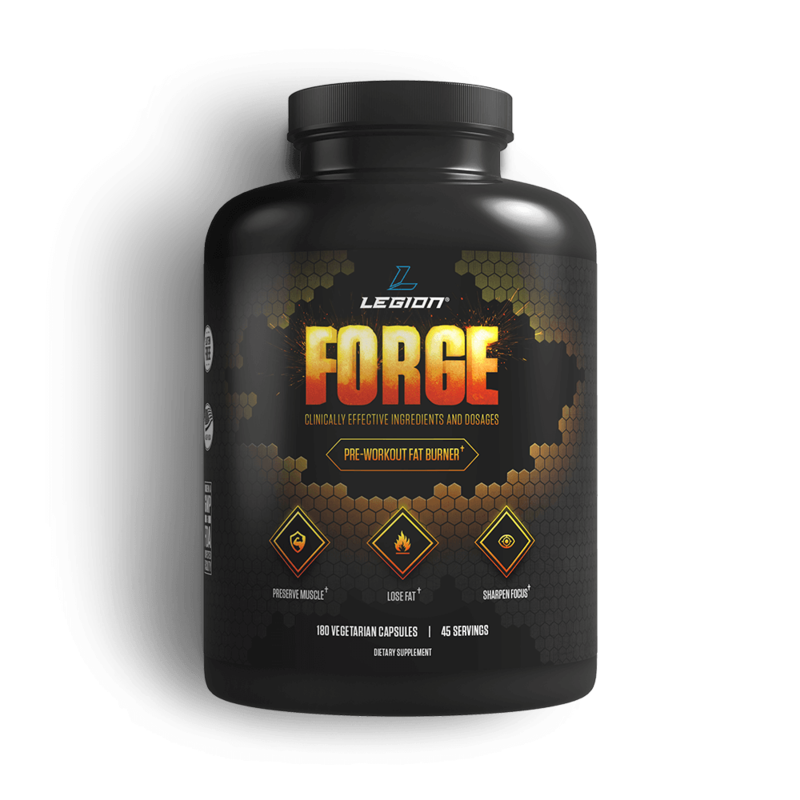 While FORGE is a potent fat burner by itself, it was built to work synergistically with caffeine. So if caffeine makes this formulation even more effective, why doesn’t it contain any? Well, we surveyed thousands of our customers and followers and found that most people prefer to get their caffeine from other sources such as coffee or a pre-workout drink like PULSE. We took this request to heart and made both of our fat loss products, PHOENIX and FORGE, caffeine-free. Once you’ve eaten food, insulin levels remain elevated for several hours while your body processes and absorbs the nutrients. The more food you eat in a meal, the more insulin your body will produce and the longer it will take to come back to the baseline, fasted state necessary for FORGE to help you lose fat faster. This is why many people prefer to do their fasted training (weightlifting and/or cardio) first thing in the morning, before eating breakfast. If you can’t train first thing in the morning, you can still benefit from FORGE. You just need to make sure you’re in a fasted state when you take it, and that means you need to plan your meals accordingly. For example, you could eat a light breakfast or lunch consisting of 30 to 40 grams of protein and the same or less carbohydrate and then train 4 to 5 hours later. This would give your body plenty of time to process the food and for insulin levels to come back to baseline. Many people also use this strategy to train in a fasted state twice per day. They wake up and do fasted cardio or weightlifting (neither is better done first—it’s just a point of personal preference), eat breakfast, eat a light lunch, and do their second round of fasted exercise before dinner. 01. Meal composition affects postprandial fatty acid oxidation. 02. Effects of carbohydrate ingestion before and during exercise on glucose kinetics and performance. 03. Lipolytic suppression following carbohydrate ingestion limits fat oxidation during exercise. 04. Effects of a 3-day fast on regional lipid and glucose metabolism in human skeletal muscle and adipose tissue. 05. Free amino acid pool and muscle protein balance after resistance exercise. 06. Signaling pathways and molecular mechanisms through which branched-chain amino acids mediate translational control of protein synthesis. 07. Isoleucine, a potent plasma glucose-lowering amino acid, stimulates glucose uptake in C2C12 myotubes. 08. Insulin production following intravenous glucose, arginine, and valine: different pattern in patients with impaired glucose tolerance and non-insulin-dependent diabetes mellitus. 09. Isoleucine, a potent plasma glucose-lowering amino acid, stimulates glucose uptake in C2C12 myotubes. 10. Increased levels of p70S6 phosphorylation in the G93A mouse model of Amyotrophic Lateral Sclerosis and in valine-exposed cortical neurons in culture. 11. Effect of protein/essential amino acids and resistance training on skeletal muscle hypertrophy: A case for whey protein. 12. The insulinogenic effect of whey protein is partially mediated by a direct effect of amino acids and GIP on β-cells. 13. Effects of branched-chain amino acid supplementation on plasma concentrations of free amino acids, insulin, and energy substrates in young men. 14. Yohimbine: the effects on body composition and exercise performance in soccer players. 15. Direct binding studies of adrenergic receptors: biochemical, physiologic, and clinical implications. 16. Structure, function, and regulation of adrenergic receptors. 17. Agonist and antagonist actions of yohimbine as compared to fluparoxan at alpha(2)-adrenergic receptors (AR)s, serotonin (5-HT)(1A), 5-HT(1B), 5-HT(1D) and dopamine D(2) and D(3) receptors. Significance for the modulation of frontocortical monoaminergic transmission and depressive states. 18. Alpha 2-antagonist compounds and lipid mobilization: evidence for a lipid mobilizing effect of oral yohimbine in healthy male volunteers. 19. Pre-exercise administration of yohimbine may enhance the efficacy of exercise training as a fat loss strategy by boosting lipolysis. 21. Yohimbine use for physical enhancement and its potential toxicity. 22. Signaling pathways and molecular mechanisms through which branched-chain amino acids mediate translational control of protein synthesis. 23. Effects of beta-hydroxy-beta-methylbutyrate supplementation during resistance training on strength, body composition, and muscle damage in trained and untrained young men: a meta-analysis. 25. Effects of leucine and its metabolite β-hydroxy-β-methylbutyrate on human skeletal muscle protein metabolism. 26. Hypoglycemic effect of isoleucine involves increased muscle glucose uptake and whole body glucose oxidation and decreased hepatic gluconeogenesis. 27. Regulation of valine metabolism in man: a stable isotope study. 29. The acute effects of four protein meals on insulin, glucose, appetite and energy intake in lean men. 31. Optimizing fat oxidation through exercise and diet. Directions: Take one capsule per 50 pounds of body weight 15 minutes prior to training. If well tolerated add one capsule per use until reaching one capsule per 25 pounds of body weight. Not intended for use by persons under the age of 18. Do not exceed recommended dose. Consult your physician prior to use if you are pregnant or nursing, or if you are at risk, have been diagnosed, or are being treated for high blood pressure, heart, kidney, or thyroid, anxiety, depression, seizure disorder, or stroke. What the heck is a “pre-workout fat burner”? We had a hard time labeling FORGE because it’s a fairly unique product. The best way to describe is, well, a “pre-workout fat burner” because it’s a fat loss supplement that is meant to be taken before you work out. That said, it’s not a full-fledged pre-workout supplement in the traditional sense because its primary purpose isn’t to acutely increase workout performance. It’s first and foremost a fat burner and the fact that it can improve workout performance as well is a bonus. How quickly will I see results with FORGE? Most people see a noticeable increase in fat loss (and especially stubborn fat loss) within two weeks of starting it. Even if FORGE helps me lose weight, will I just gain it back when I stop taking it? The only way you can regain the fat FORGE helps you lose is by dramatically overeating after you’re done dieting, which is a common mistake many people make. Instead, you should follow your weight loss diet up with a series of small increases in your calorie intake over the course of several weeks, which allows you to slowly adapt to eating more food again (avoid the dreaded post-diet binges). Will FORGE damage my metabolism? When you take FORGE, your metabolism will temporarily run faster. When you stop taking it, it will return to normal. The only way you could “damage” your metabolism, with or without FORGE, would be starving yourself for many months, and even then, research shows that the long-term effects are slight. Will I lose muscle if I do fasted exercise and take FORGE? It’s true that fasted exercise increases muscle breakdown rates, but that’s why FORGE contains a clinically effective dosage of HMB. HMB counteracts these negative effects and helps you preserve your muscle while training in a fasted state. I heard that fasted exercise doesn’t help you burn fat faster. Is that true? It’s true that fasted exercise doesn't let you somehow "cheat" the laws of energy balance. If you're not in a calorie deficit, no amount of fasted exercise is going to help you get leaner. It’s also true that fasted exercise isn’t necessary for getting lean. There’s nothing inherently wrong with “fed” exercise. Fasted exercise does "optimize" fat loss in several ways, however. First, research shows that it increases both lipolysis and fat oxidation rates. Lipolysis is the breakdown of fat cells for energy and fat oxidation is the burning of this energy by cells. So, what this research shows is that when you exercise in a fasted state, your body is able to both mobilize and burn more fat during your workouts than when insulin levels are elevated. In this way, more of your calories burned during exercise can come from fat as opposed to other sources of energy. Studies also show that blood flow in the abdominal region is increased when you exercise in a fasted state. This is important because one of the problems with the “stubborn fat” in this region is reduced blood flow. It’s also worth noting that fasted exercise is particularly effective when combined with proper supplementation, including caffeine, synephrine, and yohimbine. The reason for this is the various chemicals in the body related to fat burning work better when insulin levels are low. How do I know you’re not selling bottles of fillers like other supplement companies have been caught doing? You’ll know FORGE is a real product by the results. Many of our customers are fitness competitors that meticulously track everything while preparing for competitions, and we’ve heard from them time and time again about the benefits of FORGE. Specifically, a noticeable improvement in performance during fasted training and noticeably faster stubborn fat loss (especially in the abdominal region). You can also rest easy knowing that all of our products are manufactured here in the USA in a cGMP and NSF-certified facility (one of the largest and most respected manufacturers in the business, actually). We pay a premium for this but do it because it’s the only way we can really know what we’re getting and offering to you. FORGE only has 3 ingredients. Other fat burners have 15, 20, and some even more. What gives? Just because a product has an ingredients list a mile long doesn’t mean it’s necessarily better than a product with only a handful of ingredients. The first thing to consider is that the more ingredients there are, the smaller the dosages are generally going to be. And in many cases, the dosages get so small that they become worthless. Well, we go the other direction with our products: we use fewer ingredients at larger, clinically effective dosages found in the scientific studies that demonstrate the benefits we’re after. And the result is all-around superior products that work the way we say they do. Another thing to consider is that many molecules purported to help with fat loss simply don’t have the scientific evidence to back it up. Some examples are CLA, L-carnitine, garcinia cambogia, raspberry ketones, evodiamine, green coffee bean extract, and capsaicin, which are commonly touted as “fat burners,” but which haven’t been proven effective in clinical research or, in some cases, have even been proven ineffective. So, in the case of FORGE, each ingredient was carefully chosen based on scientific proof of safety and effectiveness, which naturally limited our choices. The result is a unique fat burner made specifically for use with fasted training, with each ingredient backed by good scientific research and included at clinically effective dosages. What does “clinically effective dosages” mean, anyway? Isn’t it just marketing lingo? When we set out to determine dosages of ingredients, we turn to the scientific literature. Specifically, we review every well-designed, well-executed, peer-reviewed study we can find on the molecule and find the dosage that confers the maximum benefits with the minimum side effects. These dosages are known as “clinically effective dosages” because they are backed by scientific studies that demonstrated they produce the desired effects. FORGE is kind of expensive. Why should I buy it over cheaper alternatives? You can certainly find cheaper fat burners, but what are you getting for your money? They hide ingredient dosages behind “proprietary blends,” which means they don’t want you to know what you’re buying. High-quality ingredients are included in small (and sometimes miniscule) dosages that are far below the clinically effective level. There are ingredients with little or no scientific evidence proving their effectiveness. Its formulation is 100% transparent, which means you know exactly what you’re getting for your money. Each ingredient is backed by well-designed, peer-reviewed research that you can review. And each ingredient is included at clinically effective levels, which are the dosages found in the scientific research backing its use. How long can I safely use FORGE for? For as long as you’re cutting. It doesn’t contain any molecules that will harm you over time. FORGE contains yohimbine, which can cause some people to feel anxious, jittery, and/or nauseous. Increased water retention is another known side effect. That said, our experience working with thousands of customers has shown us that most people either don’t experience these reactions at all or only slightly for the first few days of use (and not at all thereafter). This is why we recommend you start FORGE with ½ of a serving per day to assess your body’s tolerance before moving up to the full clinically effective dosage. I heard yohimbine is dangerous. Is that true? It’s not inherently dangerous, no. Should I take FORGE every day? You should take FORGE every day that you do fasted exercise because the more frequently you take it, the more it can help you lose fat faster. Should I take more than one serving of FORGE per day? If you don’t notice any negative side effects with one serving per day, you can increase this to two servings per day. Is FORGE suitable for both fasted weightlifting and cardio? FORGE can be taken before any type of fasted exercise, and the more intense the exercise is, the more fat you will burn as a result. Should I take FORGE if I’m bulking? Theoretically this could help prevent the accumulation of stubborn fat as you gain weight, but we don’t feel these effects would be pronounced enough to warrant the expense. Furthermore, fasted training isn’t ideal for bulking because most people will notice an increase in muscle endurance and/or strength when they eat carbs before training. So save your money and take FORGE only when you’re cutting. They are standard medium-sized pills that go down easy.